Marketing automation creates a huge advantage for organizations who deploy it for its key sales and marketing functions. Marketing automation, or MA, refers to a software platform that makes it possible to automate certain marketing actions like email, social posts, lead forms, and many others. When used properly, it can systemize your sales and marketing messages for prospect and/or customer journeys with higher precision and consistency and fewer resources. Responsory offers two levels of marketing automation services. For clients looking for MA support with their existing platform, Responsory can step right in with helping hands. From journey planning and workflow strategy to campaign set-up, execution and tracking, you can rely on our experience with MA platforms like Hubspot, Marketo, Pardot and Salesforce. Do you need an extra hand with your MA platform? Contact Responsory to start a discussion. 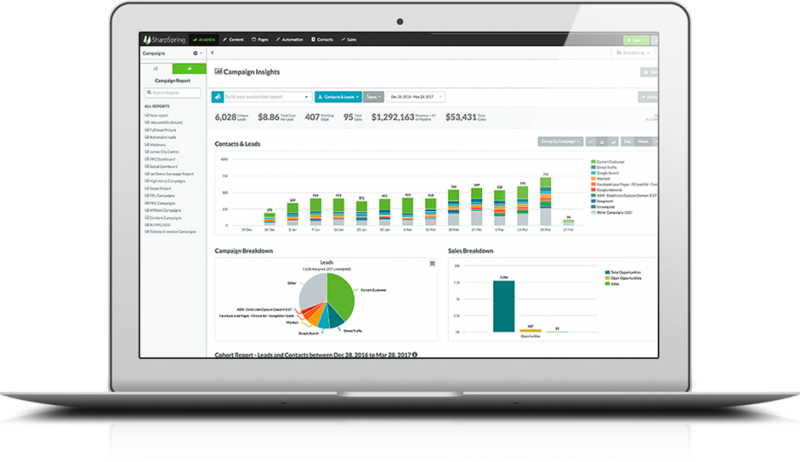 Our marketing automation platform, powered by SharpSpring, will streamline sales and marketing efforts, strengthen your marketing intelligence, automate repetitive tasks and improve your organization’s ROI. We’ll turn your inbound marketing efforts into a lead generation powerhouse with goal-based workflows, email marketing, list segmentation and personalization, content marketing and analytics. Keep scrolling to see how Marketing Automation by Responsory works. Marketing Automation by Responsory is powered by SharpSpring, a cloud-based marketing automation tool designed to help companies manage their marketing campaigns and build leads. Technology-driven marketing creates higher quality engagement opportunities and utilizes resources more wisely so your sales and marketing teams can focus on their core objectives – building and nurturing customer relationships for your business. Lean on Responsory and its resources to plan, build and execute MA-powered campaigns. When you need expertise to build awareness and/or generate leads among a target audience and 360o services, its time bring in Marketing Automation by Responsory. Have we piqued your interest? Contact us about your needs for campaign-level marketing automation. For clients without an MA platform in place, Responsory has a robust, full-service solution. With our resources, your organization will enjoy a new level of sales and marketing prowess, from lead management to trigger-based messaging and every feature in between. Could this be the answer for you? Reach out to us about annual, ongoing marketing automation. Whether you need added support for the MA software you already have or you’d like to put the power of Responsory’s all-in-one marketing automation behind your organization’s sales and marketing activities, we’re ready to help. Let’s talk. How can Responsory put its marketing automation resources to work for you?